Why is St. Catherine so Beloved? Facing crucifixion, Christ says nothing in response to Pilate’s question. 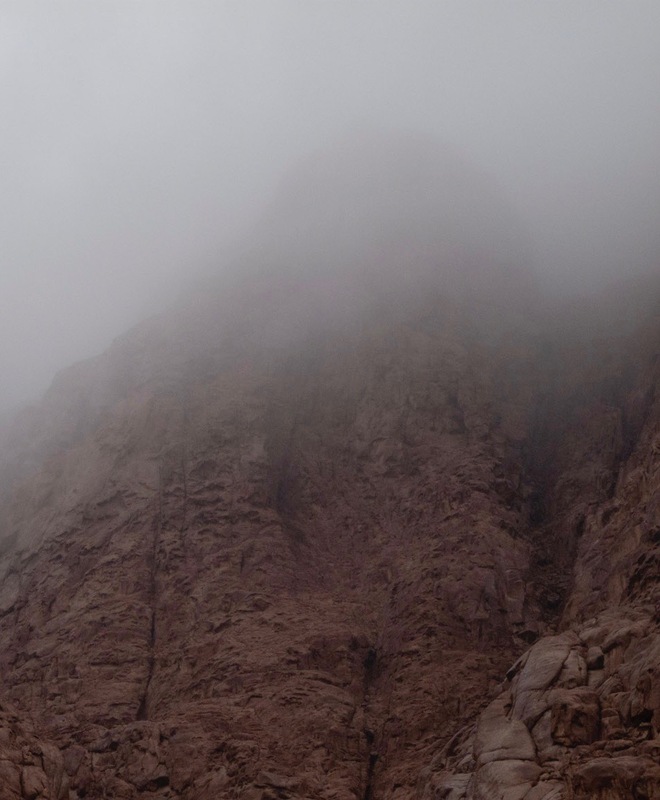 Asked to comment on this exchange, Elder Pavlos of St. Catherine’s Monastery offered insight infused with the brittle clarity of Sinai’s granite desert. In the biblical tradition of Orthodox Christianity, he explained, truth is not an argument made of words, but a Person. ‘Declaring Himself “the Way and the Truth and the Life”, Christ made this clear, for the things that He taught He Himself lived,’ said the Elder. Smoke also covered the city of Alexandria, three centuries later – not of truth this time, but of the deceit of idol worship. It was on this day, when the burning and noise of animal sacrifice filled the air with lies, that Saint Catherine the Great Martyr and Bride of Christ chose to sacrifice herself, together with every blessing this world could offer, to the Truth of Christ. 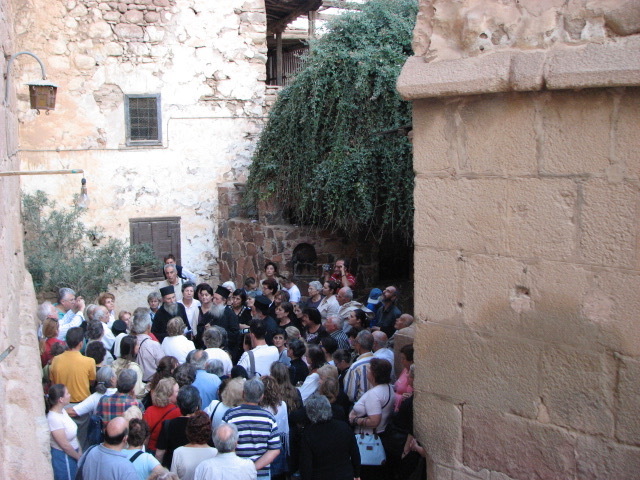 Elder Pavlos with pilgrims at the Burning Bush. Who can say whether, as a skilled linguist , Saint Catherine was not influenced by this passage? Certainly, as her Life relates, the saint was moved to pity for the idolaters of her city who were so foolishly sacrificing the salvation offered them by the one, true Sacrifice of the Lamb of God. If one thing more than another is missing from contemporary society, could it be a sense of the inner holiness whose lack every soul suffers over? Drugs, food, empty entertainments, materialism, pets – all the beckoning deceptions we plunge our hopes into, only for them to surface sooner or later on empty – What are they trying to compensate for, but loss of the confidence in becoming better than ourselves whose hopes are never disappointed, with God’s help. ‘You shall have no other gods beside Me’ had thundered upon all ages leaving no doubt of God’s abhorrence for the evils wrought on humanity by the worship of false gods – to whom cultists were sacrificing their own children … And which evils have been eradicated without honoring them, despite humanity’s continual advances in technology? Monks pray for God’s blessings on the world during their procession with Saint Catherine's relics around the katholikon on the Feastday of the Saint. It is one thing to care for God’s creation; it is quite another to place one’s hope in it; instead of in the Creator who alone makes our good works successful. As the Book of Exodus describes in detail, idol worship was continuing on Sinai at the very time Moses was receiving the Tablets written against it by the finger of God. Even after the Word of Truth is born within His creation as a man, altars to false gods are found on the Holy Mountain – idolatry continuing in the area well past the arrival of the first monks. A fourteenth century Catalonian icon representative of the Saint’s renown in Europe. In fact, abduction by pagans thirsting for human sacrifice was a real fear for remote ascetics. Saint Neilos of Sinai related the horror of his own son’s kidnapping in harrowing detail. Having followed his father into monastic life, the boy was stolen off the Mountain by barbarians intending to sacrifice him to their idols. No doubt, only another parent could understand the father’s agonizing struggle to stave off desperation while trying to recover his child. Neilos’ attempts failed, but his anguished prayers were heard. The boy was miraculously saved when the idolaters, overcome by debauchery, overslept the early morning hour appointed for their barbaric rite, and instead trafficked the boy, who was saved by a bishop and later returned to his father. With the establishment of Christianity as the state religion in the fourth century, idol worship appears to fade as a public menace. By the 20th century, Europe’s sentimental piety for the romantic legend of the Saint has exhausted itself, and lack of historic verification is felt as sufficient grounds for Saint Catherine the Great of Alexandria to be stricken from the Latin calendar of Saints, her legacy apparently made redundant by a missing birth certificate. Following Latin Pope John Paul II’s pilgrimage to St. Catherine’s in 2000, during which the gracious visitor spent several minutes visibly moved in front of her miraculously fragrant relics, the Saint quietly reappeared on the Roman calendar, celebrated as before on her historic date of November 25. Clearly, notwithstanding the recent fluctuation in her fortunes outside of Orthodox Christianity, the great martyr’s renown remained too powerful throughout Europe, from Great Britain to Russia, from Italy to Northern Europe, to long be considered irrelevant by the West. The monogram of the Saint flies over her Monastery in 2010. St. Catherine’s closes its doors to no one, and the famous pilgrim was received with all the Christian love of the brotherhood’s legendary hospitality. His hopes to conduct a prayer service in the Monastery basilica were not realized however. Why though, eighteen centuries later, is this radiance still felt so strongly, even in face of the Great martyr’s missing documentation? 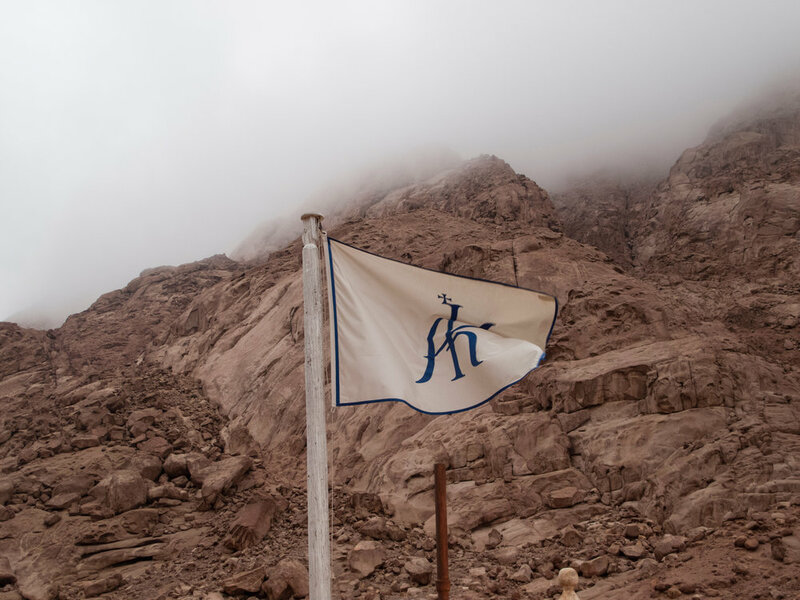 Why, indeed, the fantastic transfer of her relic by angels from the city of Alexandria to the wilderness of Sinai – to the mountains whose foundations shook with God’s condemnation of idolatry? Whose heights remember the fight of Moses and Elias against it? And whose granite aeons blink on the unchanging propensity of human nature to embrace it? 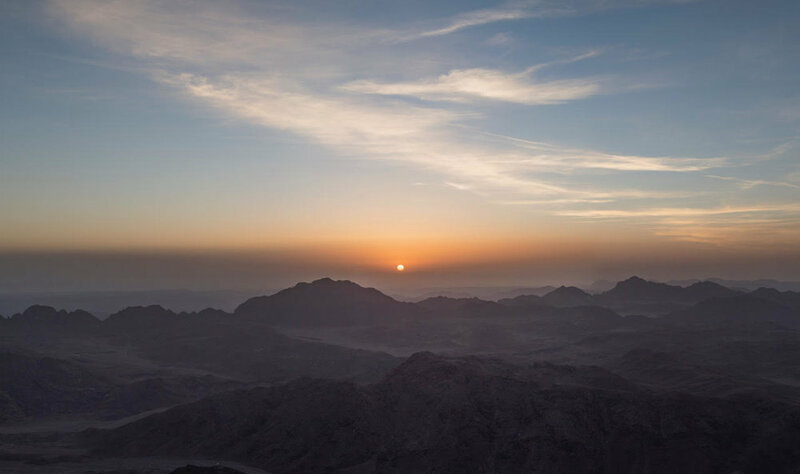 Dawn from the Holy Summit of Sinai. If idols are constituted by the same foibles that we love above God in every age, Saint Catherine’s struggle against their folly hardly belongs to any remote past. Or is there something new about the current obsession with wealth, prestige, and power? What about our veneration for every self–centered pleasure – not to mention the eminence of our own opinions? Dare we notice the shattering happiness to be found only in Christ and rise up against the deception of it all, modern culture rises up ever more shrilly to force their worship upon us; upon our insatiable desire for youth, beauty, status, possessions, aristocratic marriages, and above all, the awe of our neighbors. A young aristocrat renowned for her beauty, brilliance and learning, Saint Catherine was born to them all. Princely suitors and their palaces alone remained in the offing, but she would have none of them, enamored of the perfection found only in Christ. She escaped marriage by promising to accept the first suitor whose qualities matched a description fulfilled only by the heavenly Bridegroom – the Lord who then betrothed her to Himself in a vision that followed upon her baptism, placing a ring on her finger which remained there after the vision. Special loaves are blessed for the Monastery Feastday, imprinted with a seal depicting the saint. The loaves distributed to pilgrims as blessings of her Feast. If it is true that the more you know, the more you realize how little you know, the future saint used her classical education in the best possible way – to search out the knowledge missing to it, indeed, without which it had no value. Forming metaphysical theories to understand the human soul and its relationship to God and the natural world, the Greek philosophers posed dilemmas they couldn’t answer. Without Christ, their various concepts of the divine energeia could never explain how the unknowable God is known – not through the intellect, but through the intimacy of personal experience – to His creation. Versed in the works of the classical philosophers, Catherine had the advantage of them, not only in the counsels of a desert ascetic versed in the mystical life of Christ, but in the Holy Scriptures themselves with their revelations of His grace. ‘To know God, one must draw near to Him,’ and Peter’s confession of Jesus as ‘the Christ, the Son of the living God’ wins him the experience of Christ’s Uncreated Light that no words could teach. The knowledge that is as far beyond intellect, as the imaginary light of our own opinions is from the divine darkness on Sinai where God is known beyond all knowledge – by those with the humility to reject what they think they know. Moses has already demonstrated this at the Burning Bush. Parched brambles set afire in the almost non-existent humidity of the Sinai desert have a short shelf-life; but while apparently burning, this one neither explodes to ash nor loses a leaf. Only by removing his sandals then, to approach the Bush ‘with the footstep of his mind bare, completely free from any human trains of thought’ can Moses meet the intellectually unknowable God to learn His name, converse with Him – and understand His will. If it is only in the figurative darkness beyond human thought that God can be known, this is due not to the limits of our cognitive powers, say the eastern Fathers, but to the divine nature itself, which is inherently unintelligible, ‘above every possible object of knowledge. This is the point considered by many to draw the dividing line between Orthodox Christianity and the West. Even in remotest environs far from the world, holy monasteries are filled with a vibrant sense of life. Relics of the Saint are presented for veneration by pilgrims, who are each given a silver ring bearing her monogram. A mastery of philosophy and literature, rhetoric, mathematics, languages, and medicine acquired in Alexandria’s famed academic circles thus does not restrain the young Catherine from seeking truth beyond that of the natural world. By the grace of God, neither does a genius-level intelligence steer her into venerating the prejudices of her own intellect; nor does the admiration of others lure her into adopting their false values. Instead, the future martyr sought information about Christ from the desert ascetic previously mentioned. Having understood the trustworthiness of her teacher, she followed his guidance. Rejecting every connection with the wisdom of this world that could obstruct her path to the heavenly marriage she desired, like Moses at the Burning Bush she ‘approached the place where the mystery is received’ with ‘the footstep’ of her mind ‘bare’. And, together with the prophet whose struggle for truth mirrored her own, she met Christ – by faith alone. A fugitive from justice, in what must have been rather a steep decline from his former life at Pharaoh’s court, Moses spent forty invisible years in the remote desert as a shepherd. His crime was not deliberate; in coming to the defense of a fellow Israelite, he had accidentally killed an Egyptian. The sheep he guarded for so many years, as His Eminence, Archbishop Damianos once pointed out, were not even his own (in which one might at least have vested some interest). Having thus emptied himself of all worldly glory, Moses is the one chosen by God to save His people. In the work of a single day, Saint Catherine also gave up everything life had given her in order to rescue God’s people – following not only Moses, but the Word of Truth Himself, Who, ‘being God … emptied Himself, taking the form of a servant’ in order to save his estranged humanity. Having led the Israelites out from their slavery to Pharaoh, Moses saw God on Sinai, his face radiating so brilliantly as a result that no one could look at him. Fifteen centuries later – having rescued hundreds of soldiers, orators, scholars, court officials, even the emperor’s wife, from slavery to idolatry with her formidable defense of truth – the prison cell of Saint Catherine filled with the Uncreated Light. Finally, unable to dim this Light of her witness to Christ’s Truth, neither through debate with his philosophers nor the trials of torture, the emperor had the Great-martyr beheaded. Carried to Sinai by angels, her relic was revealed to the monks some centuries later and ensconced in the sanctuary of their great basilica. Saint Catherine’s reliquary; in the background, an ancient tapestry depicts the translation of her relic by angels to Sinai. Today, the idea of emptying oneself seems relegated to monasteries, whose inhabitants leave all worldly ties behind, hoping to shed the inventions of whatever social order shaped them in its own mold. But if the example of serious illness is any use, which they say brings us close to God by awakening our faith, emptying oneself means transcending the superficialities of a godless society, in order to discover the unique personality within – a process hardly beneficial to monks alone. Indeed, both Prophet Moses and the Patriarch Abraham, upon whose faith our Christian tradition rests, were married. In a world resting on the laurels of its intellectual prowess rather than the Presence, through the grace of the Holy Spirit, of its saints – how does one empty himself to live with God? Rejecting the idol worship of a society that elects to remain in ignorance of God, then, Orthodox Christians are not pursuing the exterior contact with grace enjoyed by all the natural world. Neither, like some traditions, do they look to vision of the divine essence in the next life – but rather, to union with God’s energies in this one – the meaning of the Life for which every human being on this earth was created. But it should be noted, nowhere does biblical Christianity frown on the enjoyment of God’s material blessings. Of all the trees that filled the Garden of Delights with enjoyment, Adam was charged to refrain from eating only of one. The tree of the knowledge of good and evil was to suffice as remembrance of Him from whom all blessings spring. What did the Creator of all reply when one out of ten sufferers healed by His love from leprosy returned to say thank you? Biblical Orthodox Christianity thus asks only one thing: To not put everything – anything – above God. We do not know the previous life of the grateful recipient of Christ’s healing from leprosy. One thing seems clear though; that, like many others since, his soul found Christ through illness. At the holy altar on the Feast of the Saint, Father Pavlos borrows the glow of a few tapers to read names of those who have sought his prayers. ‘But the opposite also happens, noted Elder Pavlos. ‘It is not only through sorrows that one finds God, but through great joy as well, even if less often. Indeed, these things are mysteries; do not look for logic to solve them because logic cannot explain everything. 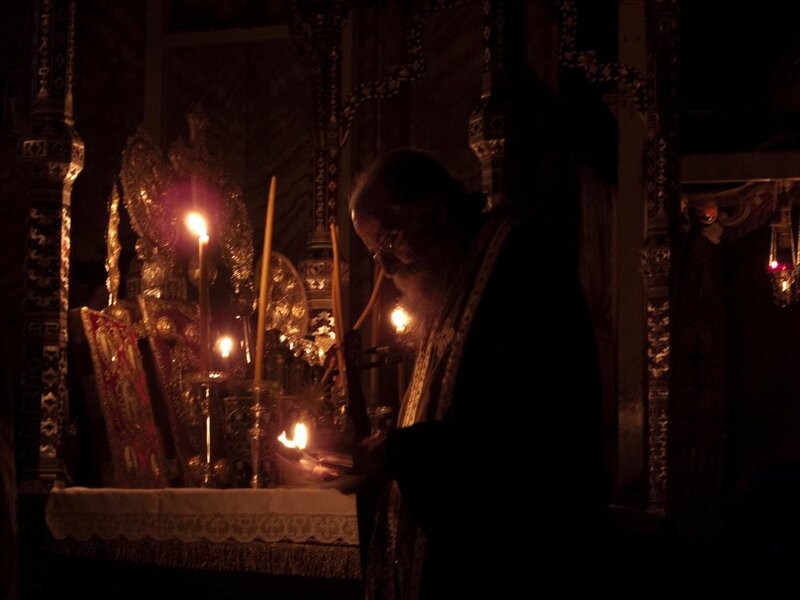 ‘It is true that sorrow often reveals the closeness of God through pain, but the same thing happens through joy, especially in the Divine Liturgy. An indescribable atmosphere is created inside the church during the Liturgy, for what takes place there is not human, but divine and heavenly. In a eucharistic society, then, thanksgiving consists not of taking from God, but of giving back; offering not empty sentiment in return for His countless blessings, but something of oneself … How, then, does one approach the Mystery of Divine Thanksgiving? The martyrdom of the Cross is not for everyone, observed the Elder. But living honorably with God can constitute a kind of martyrdom, he said, for keeping His commandments can be difficult, especially when others are pressuring you not to. By the same token, if anyone truly honors the holy fasting periods preceding the great Feasts which Orthodox Christians treasure far above the empty joys of a sated stomach – when none around him value this as worship of God – he can rejoice in having smashed a great idol. Pagan secularism may be alive and well, and not unheard of even amongst Orthodox Christians, but having affirmed that our faith is pure and true, the Elder refuses to concede the slightest hope. Prayer, fasting, and almsgiving are offered by the Orthodox faith as aids for those who wish to go closer to God, he notes, affirming that prayer is the greatest work of a monastic. 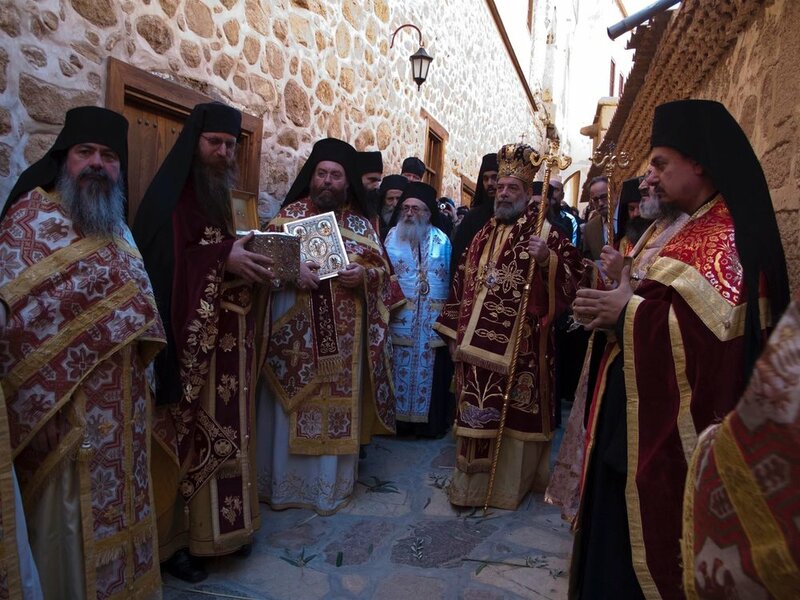 But like St. Catherine’s Saint Paisios who filled the desert with love for the Monastery’s Bedouin neighbors before him, the Elder also emphasizes the obligation of the monks to materially assist the Bedouin who have offered so much, for so many centuries, to the Monastery they consider home. Thirteenth century icon of Saint Catherine with scenes from her life and martyrdom. ‘Christians sacrifice,’ says Father Pavlos, insisting there are saints living within society whose holy works we never see, because they are hidden in Christ. Thus, whether one sacrifices himself within monastery walls or without is not the point. What matters is that one’s good works are done in the name of Christ, say the Fathers. Whether one achieves this by helping monasteries to present the truth of Christ to the world, or in other ways, most important is that our good works not become an end in themselves, as commonly happens in secular society – by which even our fasting and charity become idols. The Spirit-bearing fathers never fail to point out that ascetic practice is but a means to an end, of our sanctification through sacrifice to the glory of God. ‘The moment you judge your neighbor,’ cautions Father Pavlos, ‘consider that day lost – all its good works wasted.’ Only by avoiding idolatry in all its forms can we become vessels of God’s love to the world, by becoming, ourselves, vessels of the Holy Spirit. Spirit-bearing elders such as Saint Paisios speak of the force of the divine love that unexpectedly overcomes them, usually during prayer, almost beyond what the soul can endure. Such love spills over from such saints to all the world, benefiting even those who don’t know them. Does something like this account for the staggering courage of the day when youth, beauty, wealth, status, luxury – everything our secular culture would have us worship instead of God – was thrown at the feet of idolatry by the Bride of Christ? If the greatest gift of unchanging Orthodox Christianity is its preservation of the ways by which sincere Christians joyfully give back to God instead of obsessively looking for new ways to take from Him, the message of Saint Catherine resounds from the Holy Mountain of Sinai as the universal icon of divine ascent throughout all ages: In the biblical tradition of the Orthodox faith, theology is not for the academics; mysticism is not for the saints; and neither is spiritual life reserved for the monks. All are called to the personal experience of God, to the sacrifice of praise offered by the royal priesthood to whom all were called by the Truth of His love, on the God-trodden, Holy Mountain of Sinai. Vladimir Lossky, The Mystical Theology of the Eastern Church, (New York: St. Vladimir’s Seminary Press, 1976), p. 39. Lossky, Mystical Theology, p. 25. ‘As Moses led the people out of Egypt …the Law frees its subjects from idolatry, whereas the grace of the Gospels leads to the Kingdom of Heaven.’ Theodoret of Cyrus: The Questions on the Octateuch, Volume 2, tr., Robert C. Hill (Washington DC: CUA Press, 2007), p 247.